I want to improve my antiquing process and I still have difficulty with scratches; I'm not able to copy little scratches without being naive. 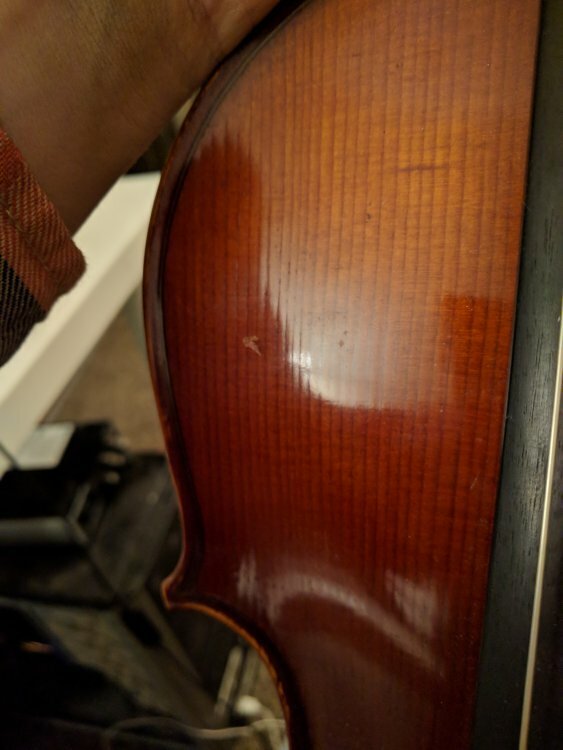 Does anybody can help me to reproduce very tiny scratches like those we can see on the back of the Plowden of Guarneri Del Gesu? I haven't antiqued a violin, but I've antiqued (roughed up) other bits and pieces. If you want to mimic very fine scratches I'd try just laying the violin down on various rougher surfaces and 'dragging' it across the surface (to mimic what would be years of 'normal' use). Check to make sure you're not overdoing it - while you're doing it. There is no easy way, you just have to make 100,000 scratches on the thing in logical places with various methods and layer them so that some get schmutz in them and some don't. I watched my husband antique an instrument last week and I noticed that much more varnish was involved than I would have thought. It was applied, removed, polished, applied, removed again, schmutz scrubbed in the surface nicks, and so forth. He has several little rocks he uses, all kinds of little tools. I think the secret is to be patient and use lots of methods, so it'll look real. If you want your scratches to look and act right, you need to start with the right varnish. Try to vary the type of scratches a bit, their depth, and their colour within the varnish layers. Otherwise, I find it tricky too. I know packing tape, paper towels and alcohol can be very useful. Different implements and turning the instrument so you are marking in random directions. I use small rocks of varying type, wooden tools like brush handles, small dental tools etc. Single marks with one implement then another in a different place with a different implement and so on.. Also think what direction the marks are coming from. which areas are most vulnerable to damage etc. Finally put some marks in early in your varnish process and others after each coat they will fill in and look more random. Also color in any deeper scratches or marks in a way that mimics your marking methods, a variety of colors applied randomly one color here and another there. Most dirt or old retouching will be a greenish brown of varying intensity or hue. Black should be avoided as it really doesn't happen naturally. There is no easy way, you just have to make 100,000 scratches on the thing in logical places with various methods and layer them so that some get schmutz in them and some don't. I think it's also important to vary the color and intensity of schmutz in the dents and scratches, and not have it all the same. While there are a few antiques with schmutz colors quite similar all over, they are more the exception than the rule, and it tends to look fake. Edit: Oops, looks like Nathan beat me to it. A good friend and well "decorated" violin maker gave me good advice: "Think of what you want to do. Then do 10% of that and MAYBE you haven't done too much." Honest questions(s) here. No sarcasm or opinion attempt. I completely understand the concept of antiquing when one is attempting a bench copy of a specific instrument from the "classical period". 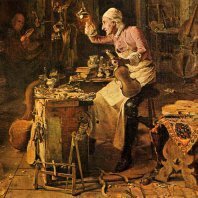 Is the general antiquing seen on the majority of new instruments, from inexpensive Chinese/European instruments, to well made quality instruments that are built as "non-copies", driven by market forces? I think that's most of it. Even when someone knows almost nothing about violins, they've probably at least seen photos of megabuck antiques, and the most easily distinguishable feature is that the bulk of them look really old and worn. So that association between quality, value, and worn-looking can get "baked in" early on. I admire the immense amount of skill and good taste required to artfully antique a fiddle, but I'm put off by the main reason it is done - to satisfy a market demand motivated by a classist desire to boost status. A bit more to it than that. Most completely pristine violins go through an awkward phase when they start getting natural nicks and scratches and look damaged rather than patinated. An initial treatment of some judicious wear and aging prevents the first scratch from becoming a trauma and lets normal wear and tear be blended in with no problem. I appreciate your perspective, Nathan. I apologise for such a pessimistic post above. Being at a large conservatory I hear people talk a lot about their next instrument purchase, and across all skill levels it becomes obvious that looks are just as important as sound to many, and the older looking the better. Just strikes me as rather shallow. Being at a large conservatory I hear people talk a lot about their next instrument purchase, and across all skill levels it becomes obvious that looks are just as important as sound to many, and the older looking the better. Just strikes me as rather shallow. Seems to me you're in a position to change that. Concentrate your effort on making the best sounding violin that your ability will allow. Something that will make others say Maberry's violins are real good and his varnish isn't antiqued. Weather this takes you two or three builds or upwards of fifteen to twenty is unknown now so I'd recommend you go the straight varnish route vs something of the "antiqued look". Do that then I'd think you'd get more praise from the likes of Burgess and Sora - they won't publicly admit this but they do frown upon new work with antiqued looking finishes. Maybe not frowned upon but close too. 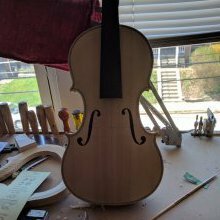 It is possible to make a violin look 300 years old and use a straight varnish but you'll more than likely have to study the English school way of doing things for best results. You just do what you think is right. From what I read so far so good for you excepting the router debacle, oops. I think it,s important to remember that at it's core the violin is an aesthetic experience, Like cool cars, or any of a plethora of fun things.shallow ? Yea, it,s not medicine...or war...or .... economics.... but it does give some feeling time ,place connection. I say have fun, do what you love. Mr. Sora makes the sexiest straight varnished violins that I've ever seen in my life. No antiquing job, no matter how good, can hold a candle to his work (to me at least). Sometimes people really go for what they prefer, and become excellent at it. I myself really enjoy the straight out of the box look. It's more honest to me, and that's what I'm striving for. And as Duke put it, if one really wants to do straight like new varnish, own it. I like the color of that. What is it? also here is a short video teaching how to make a fake cracks start at 03:55 minutes . To be honest I'm not sure. I think it might be a spirit varnish. It rubs off in an instant with any alcohol based polish. You can see on the edge where the varnish was stripped down to the ground in a few swipes. Whatever it is, it's an attractive color.